Joining the snaking hundreds deep queue for immigration at Kolkata airport we noticed a small sign with an arrow pointing towards the e-tourist visa counters and smugly joined the much smaller 30 deep queue instead. The smugness wore off when we were still waiting half an hour after the previous queue had cleared. If you arrive on an e- tourist visa you will have your biometrics taken at the airport. 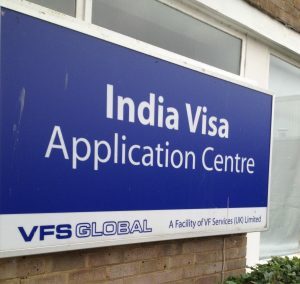 Since 2016 everyone travelling to India requiring a visa will need to provide biometrics but if you apply for your visa the old fashioned way via VFS Global you provide your biometrics before you leave – still long winded – but in my opinion better than having them taken at the airport. For the majority of the time there was only one counter open and the process of collecting our biometrics was painfully slow. The digital fingerprint machine needed several attempts to collect thumb and 4 fingers from each hand – each time the machine glass needing to be wiped and having to continuously have your fingers wiped of any grease to work – and then the staring into the camera for ages for the photograph. Will this happen every time ? I was assured that this process only happens once and next time I would not need to have biometrics taken again but if you still have to join the e-tourist visa queue and everyone in front of you needs their biometrics recorded you will still be there for a very long time. Some research on the internet has thrown up horror stories of the process taking 6 hours so in comparison we were fortunate – if you can call it that. I did try to ascertain which queue I would have to join on a subsequent visit but didn’t manage to get an answer – will update this post if I find out. Luckily our hotel driver was still waiting for us. If you were arriving later in the day be aware it is apparently difficult to get a taxi from Kolkata airport after 10 pm . And on a more serious note – if you were planning to get a connective flight – you might well miss it. Please don’t let the visa problems put you off travelling to India – as the advertisement claims .. it is indeed Incredible ! Why not leave a comment below and share you’re experience ? One of the mistakes I made the first time I travelled to India was to take the advice found on many blogs regarding taking toilet roll to India – What was I thinking ? Yes there were occasions where I needed some tissue for the bathroom but had to fish into my suitcase / rucksack for the messy unravelling loo roll. And how discreet was that ? Not. 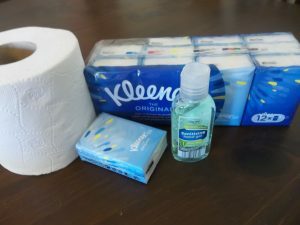 I learned from this and now make sure I pack lots of small packs of 12 tissues. They fit easily into pockets, rucksacks, daypacks bumbags and inside shoes and corners of your suitcase/backpack – and if you have them tucked away everywhere you are not going to have to be searching around for them. 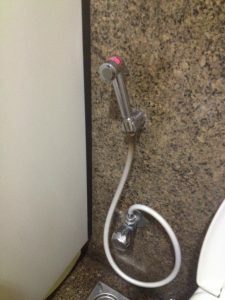 I did not encounter any squat toilets during my travels – all were flush toilets – but I did encounter the spray hose ( spray wash yourself clean) and also the jug ( to be filled with water and poured over yourself to clean). Often there was also an option of loo roll but not always. I did use both the spray and jug methods – hygienic I guess but I wasn’t sure how I was supposed to dry myself afterwards – so still needed tissue. It is easier if wearing a skirt than trousers – I will have to research the logistics of using these methods a little better for my next visit! By the way – you are supposed to use your left hand for all toilet business – and your right for eating. Mostly there were hand washing facilities but again not always. 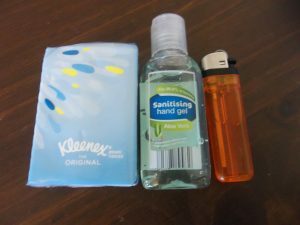 I would recommend taking hand sanitising gel – I usually have a small one of these wherever I go even in UK. Although cheaper per ml to buy larger size bottles – again I would take several smaller bottles – I buy mine from Aldi – a small 50ml bottle is less than 50p. These again can be tucked into pockets, handbags, bumbags etc and if you have several you will always find one. For the journey home they are so cheap you can leave all but one bottle in India so that you have plenty of room to bring back all your favourite Indian souveniers. I will go into detail in a later blog about items to take and leave in India. If you have a compromised immune system or you are working in an environment where a more professional hand sanitizer is required – or you just want to be extra careful , I would recommend Purell which comes with a handy lanyard to hang around your neck. I recently voluteered at Mother Terasa’s in Kolkata and used this system. The online e-tourist visa shows up on my bank statement as £49.37 and an additional 99p non-sterling transaction fee – this is for a single entry to India and is valid for only 30 days from the date of arrival in India . The application process for the e-tourist visa was not straightforward – read some tips here in my blog post FILLING IN THE INDIAN E-TOURIST E-VISA VISA .